A Special Goods Declaration and 5 duplicates. An Identification card and passport of the master of the vehicle, including an international driving license. A Letter of Attorney, in case where the master of the vehicle does not own the vehicle. An application form for the temporary import of personal vehicles. Evidence of purchase e.g. a proforma invoice, invoice, etc. A Certificate of Legal Entity. In case where the importer is unable to deposit a guarantee either in a form of a cash deposit or a bank guarantee, he/she may request the embassy to issue a letter to Customs for granting approval of the importer’s self-guarantee. The term “yacht/ sports boat” means any boat used solely for pleasure or sports; but excluding those imported for commercial, military, and scientific research purposes. A master of a yacht/sports boat or fishing vessel from abroad is required to make an arrival and departure reports of such boat or vessel to Customs upon the arrival or departure, as the case may be. Customs inspects the vehicle and personal belongings, records the re-exported vehicle, writes off the import registration electronically, then, discharges the cash deposit or bank guarantee posted at the time of importation to the exporter/agent. In case where the importer fails to re-export the vehicle within the time-limit as set out in the bond and security paper, Customs will impose the full amount of a cash deposit or bank guarantee posted at the time of importation without any reduction. 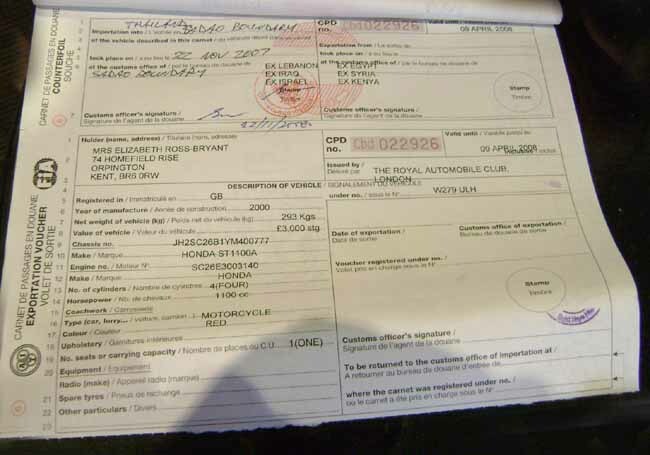 When the temporary time-limit set in the bond and security paper is due, or an importer provides a written notice to Customs that he does not wish to re-export the vehicles temporarily imported, Customs will impose the full amount of liable taxes and duties as indicated without any reduction. In case where motor vehicles or motorcycles are temporarily imported into Thailand for a short visit via the border points and to be re-exported at the conclusion of the visit, but the importer fails to do so within the time-limit as indicated in the bond and security paper, provided he/she does not intend to violate the regulations, a 100-Baht fine per day, but not exceeding1,000 Baht in total, shall be charged from the due date of the Contract. In case where boats/vessels are temporarily brought into Thailand and to be re-exported at the conclusion of the visit, but the importer fails to do so within the time-limit as indicated in the bond and security paper, provided he/she does not intend to violate the regulations, a 500-Baht fine per day, but not exceeding 5,000 Baht in total, shall be charged from the due date of the Contract. In case where an importer wants to extend the temporary allowance as set out in the bond and security paper, Customs may extend the time-limit to allow the vehicle to remain in Thailand for up to six months. In exceptional circumstances e.g. a broken engine, car accident, etc., the time-limit may be extended to more than six months but not exceeding eight months from the date of importation. The extension of the temporary allowance can be applied at a Customs House. We are happy to quote you customs clearance both import and export side. SEE [ TEMPORARY IMPORTING VEHICLES ] INTO THAILAND RULES. For returning Thais wanting to bring cars into Thailand please send full details of car: year, make, model,cc rating, when purchased overseas, whose the owner and specs & picture. We can clear cars for you once we know these facts.